IV vitamin and nutrient therapy is a safe, powerful and innovative way to administer vitamins, minerals, amino acids and other nutrients into the body that by-passes the gastrointestinal system providing improved absorption and efficacy. This mechanism of administration supports the improvement of numerous health problems such as infections, fatigue, allergies, poor wound healing, anemia, heart disease, depression and anxiety. In addition to improved health, it provides anti-aging benefits, bolsters the immune system and supports overall wellness. 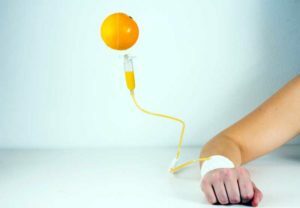 As soon as an IV infusion starts, vitamins, minerals, amino acids and other nutrients are quickly circulated through the bloodstream and delivered to cells, where they are used immediately. This IV therapy bypasses the stomach and intestines which means no upset stomach or intestinal problems like cramps, nausea or diarrhea which can result from taking the high oral doses needed to achieve the appropriate tissue concentrations necessary to exert its beneficial effects. Furthermore, the bulk of the vitamins and minerals swallowed orally in pill or liquid form is excreted with only a minimal amount actually absorbed into the bloodstream.